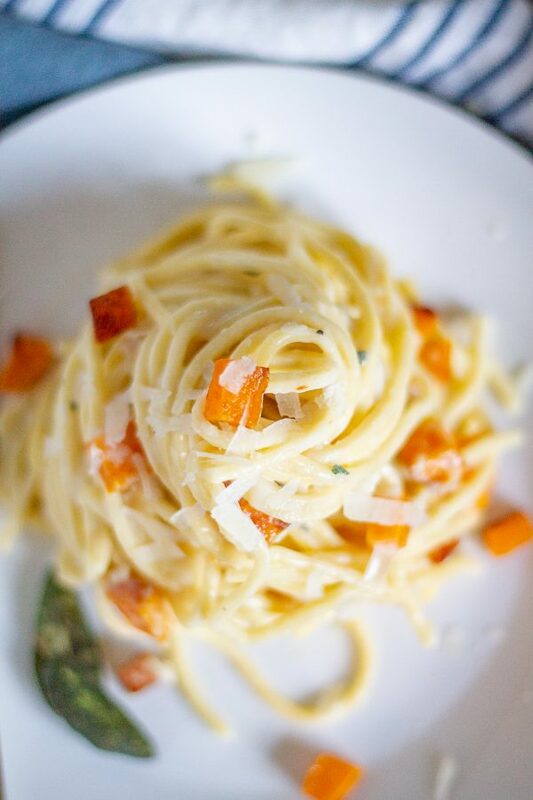 This fall pasta is an ode to fall flavors and one of my favorite flavor combinations: goat cheese, sage, and butternut squash. 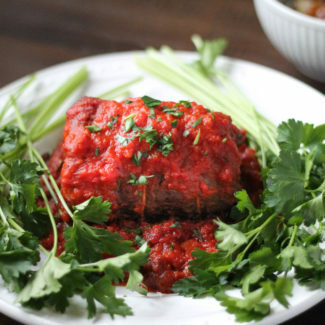 It’s quick enough to be a weeknight meal, and it works as a main dish or a side. 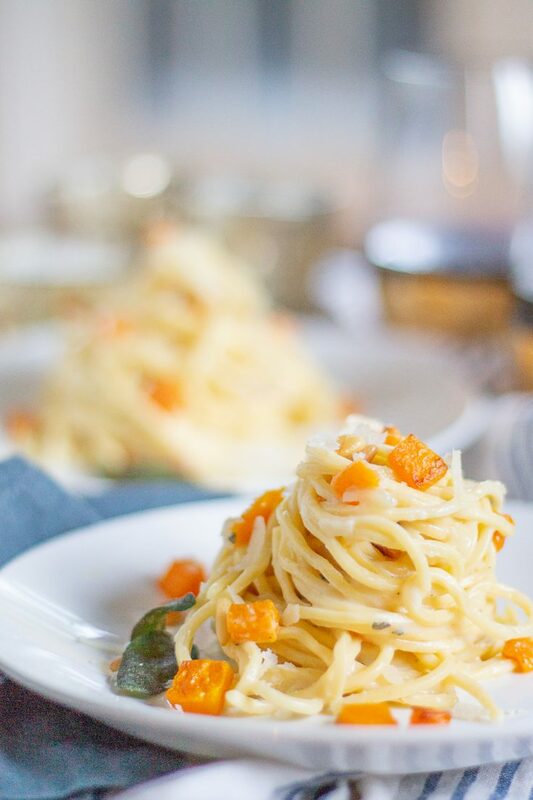 This pasta has a mild creamy goat cheese sauce seasoned with sage and chunks of roasted butternut squash topped with toasted pine nuts and fried sage leaves. It is simple and satisfying. 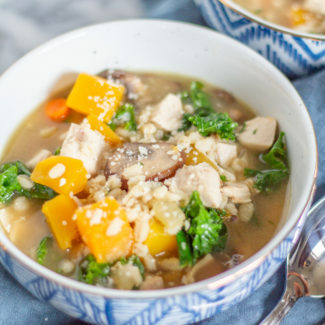 I love how the mellow flavor of the goat cheese really lets the squash and sage stand out. And the pine nuts give a nice salty crunch. 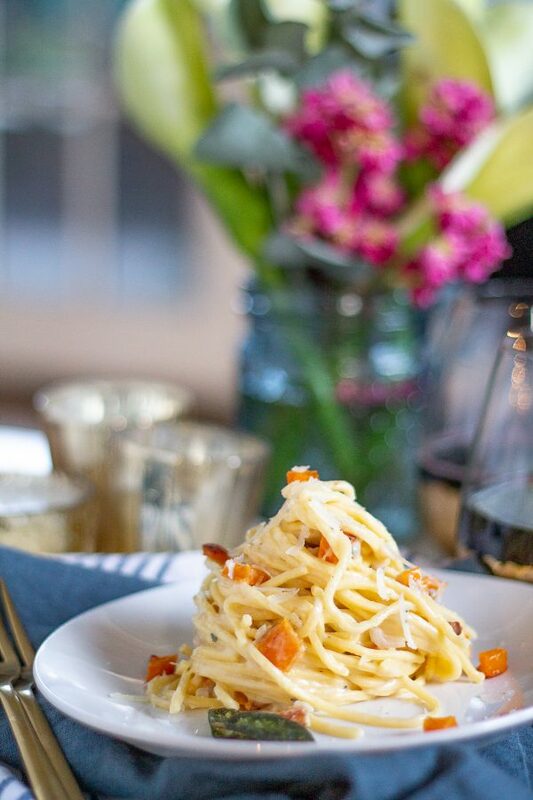 I love recipes like this that are uncomplicated and let each ingredient shine. Fried sage leaves add both texture and taste to this recipe. I fried up about 8 sage leaves and crumbed a couple right into the goat cheese sauce, and the flavor infused into the creamy goat cheese sauce. Butternut squash is tough to cut. I always recommend buying precut squash and eliminating the chance of your cutting yourself. It’s worth the couple extra bucks to save yourself the time and effort. 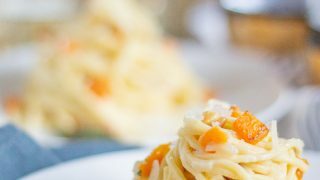 I used fresh pasta that I purchased at Eataly, and I could taste the difference. It cooked to be a perfect al dente and held the sauce perfectly. 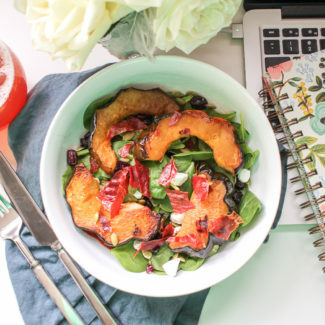 This recipe doesn’t require much active preparation time (especially with pre-cut squash) but you do need to roast the squash for about 35 minutes. Get that going first, and then once the squash is just starting to get browned, go to work on the sauce and cook your pasta. 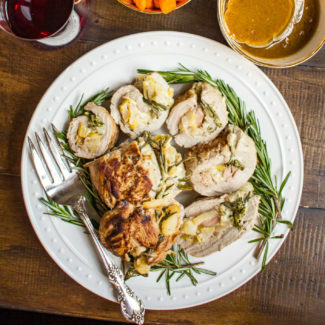 If you want to try another recipe utilizing this flavor combination, try this Pork Tenderloin filled with Goat Cheese, Sage, and Butternut Squash. 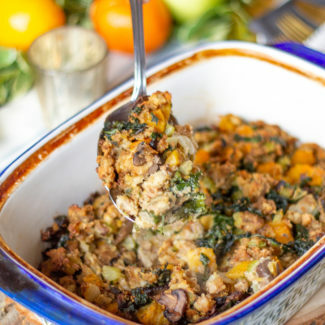 It is always a bit hit – I made with for Christmas dinner at my in-laws a few years ago and they loved it. 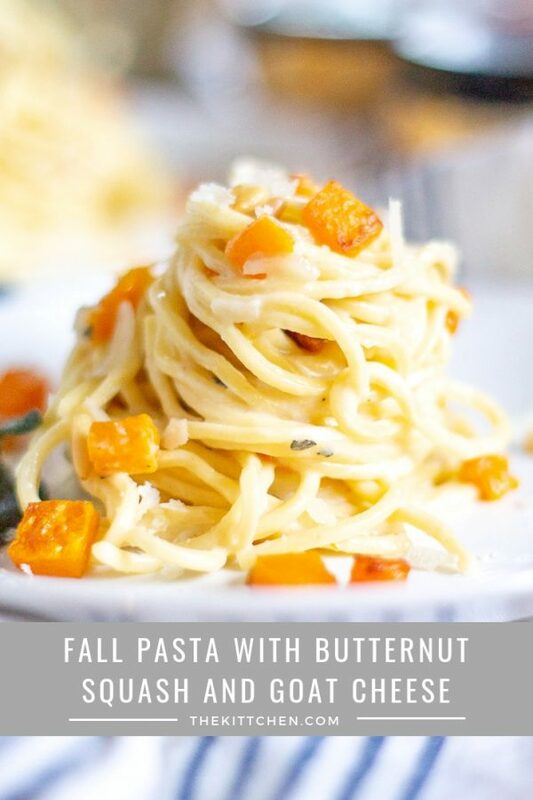 This fall pasta is an ode to fall flavors and one of my favorite flavor combinations: goat cheese, sage, and butternut squash. 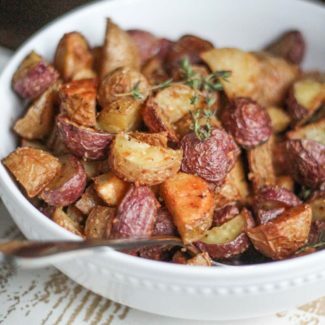 It's quick enough to be a weeknight meal, and it works as a main dish or a side. First you want to get the squash going. Spread the cubed squash out on a parchment lined baking sheet. The parchment helps the squash to cook evenly - I always use it. Then drizzle 1 tablespoon of melted butter over the squash and dust with some salt and pepper. Let the squash roast in a 350 degree oven for just about 35 minutes, until it is soft. Now you want to toast your pine nuts. Heat 1 teaspoon olive oil in a small skillet over medium-low heat. Once the oil is hot, add the pine nuts. Keep you eye on them, and stir frequently until the nuts are lightly toasted. Then remove from the pan and set aside - you must remove from the pan, if you keep them in the hot pan they may burn. Next, fry your sage leaves. Heat the remaining olive oil in a small pan over medium heat. Once the oil is hot, add the sage leaves, being sure to space them out. Cook each side of the leaves for a minute or two, until they are firm enough to be flipped. Once the squash is almost done, get to work on preparing the pasta and the sauce. Bring a pot of salted water to boil for the pasta. Meanwhile, start on the sauce. Heat 1 tablespoon butter in a skillet or saucepan over medium heat. Add the shallot and sauté for 2 minutes, season with some salt and pepper. Then add the garlic and sauté for another minute. Next whisk in the flour, and let cook for 1 minute. Then whisk in the milk. Bring to a slow and steady bubble, and whisk constantly letting the mixture thicken for 1 minute. Then add the goat cheese and parmesan and whisk to combine. Crumble 3 of the sage leaves into the sauce, stir the sauce, and then keep warm over low heat. Cook the pasta according to the directions. Once it is ready, remove 1/2 cup of the pasta water and stir it into the sauce. 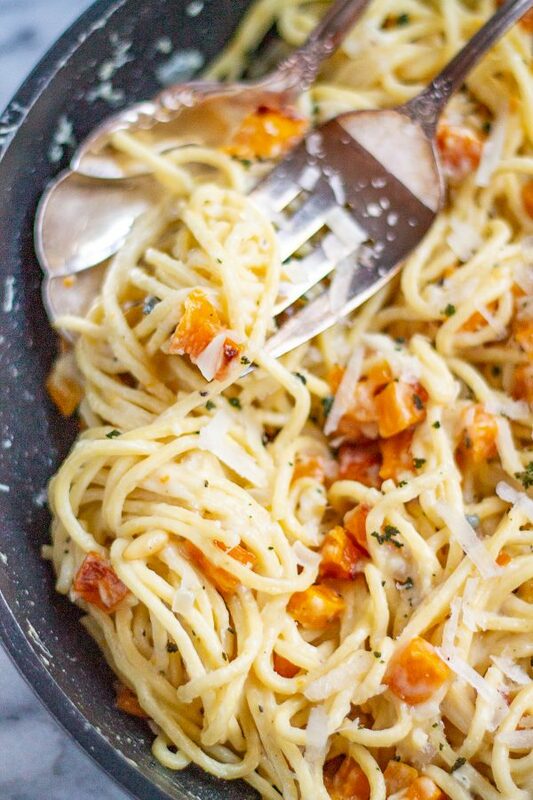 Drain the pasta, and add it to the sauce along with the butternut squash. Let everything cook together for 1 minute. 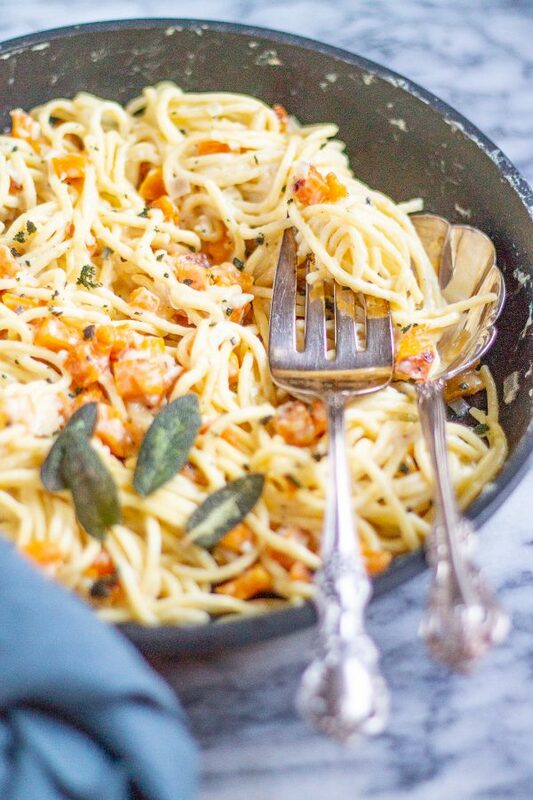 Then serve the pasta topped with the pine nuts and remaining sage leaves.